Admittedly, brining a turkey does bring out flavor, and adds sweet juiciness to even the driest parts of the turkey. However, making room for a two-day bird-bath in your refrigerator delivers quite a challenge to an already-over burdened, holiday-stocked refrigerator. Last Thanksgiving, I turned the same aromatic herbs I typically use for a turkey brine into a salt rub. This is similar to the way in which you cook cheap cuts of read meat, to seal in the moistness. The process was effortless, and the results were outstanding. Just like the brined turkey, the rubbed bird was tasty and juicy; and I was free of the 3-day struggling of finding room for the turkey’s bath. Here’s how to give your turkey a salt rub. Using a coffee grinder, or a mortal and pestle, grind spices together just enough to break them down. Rub the mixture evenly over the skin of the turkey. Let the turkey sit, uncovered, in the refrigerator overnight. The next day, baking day, brush off the salt and roast as usual. 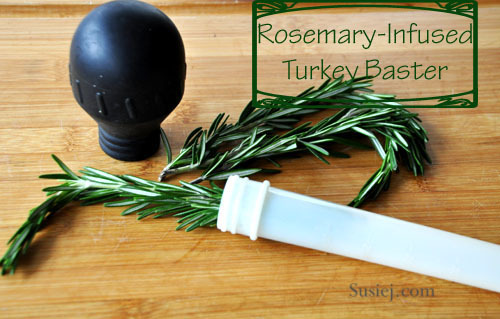 Be sure to use the rosemary-infused baster..
Roast until the turkey starts to brown, about 25 minutes. Turn down the oven to 350 and roast about 10 minutes per pound, for a total of 2-21/2 hours, until an instant-read thermometer inserted in the thickest part of the thigh reads 160 degrees F.
As the turkey roasts, baste frequently with the pan juices, with the rosemary brush. If the bird begins to darken too much, cover loosely with foil. Remove the turkey from the oven, transfer to a serving platter, and let rest for 20 minutes before carving. Thanks for pointing this out! I ordered a turkey from my local organic market over a week ago and picked it up yesterday, thinking I’d have just enough time to brine it. Instead, the turkey was frozen solid. GAR! So your salt-rub tip is so perfect. 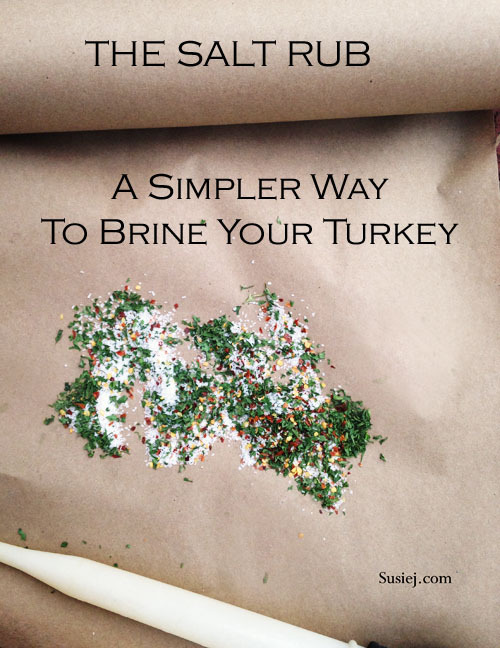 Susiej | The Salt Rub: An Easier Alternative to the Turkey Brine. Hi there I am from Australia, this time I am viewing this cooking related video at this site, I am truly happy and learning more from it. Thanks for sharing.